For me and the rest of the Houghton household, it’s been a busy six months since my last post announcing the launch of BEFORE YOU LEAP back in November. We completed a house move, two writing deadlines, and two foreign vacations – not to mention Christmas and shoulder surgery – plus, all the regular stuff that ‘gets in the way’ of things. So, it’s no wonder I haven’t found time to blog. So, let’s catch up . . .
financial positon to go for it. But as time went on, and the more we looked around, the more this house seemed to outshine theothers. We got a viewing, decided that it had great potential for us and that we liked it enough to take the plunge, and so we did. Then it was a case of selling the house where I’d lived with Lynn since 2002 and she since 1979, and drumming up enough money to take the leap. We moved in October, selling our other house just three weeks later, and we haven’t looked back since. 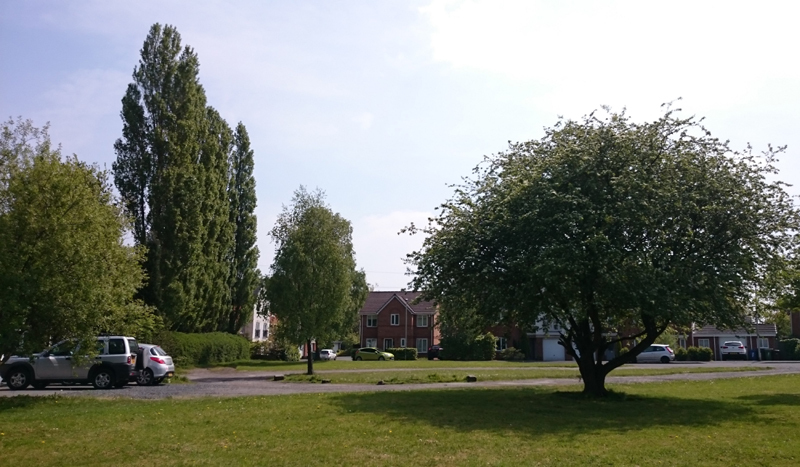 At first, we were sure we’d miss the old place, as it held so many memories for us, both good and bad, with those most close to us who are no longer with us, but as it turns out, we’ve never been happier. It’s a new start for not only us, but for the family as a whole, and we thank our blessings every day for being able to get away from those terrible neighbours! 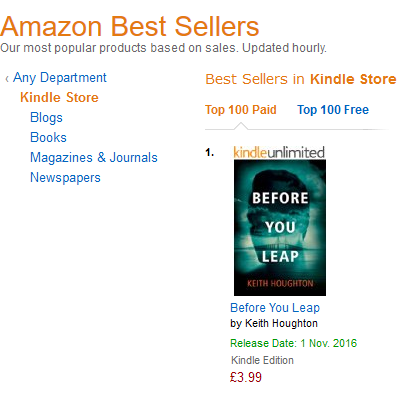 T he best news about the launch of BEFORE YOU LEAP was that Amazon Publishing decided to place it as a Kindle First in all its major territories. This meant a huge spike in visibility for the book, taking it to the #2 spot in the US Kindle Store and the #1 slot in both the UK and the Australian Kindle Stores several times during the first few weeks. As you can imagine, I was chuffed to bits with the performance, and can’t thank APUB enough for promoting my second outing with them. While we’re on the subject, one thing I will say about Amazon Publishing is that the support I get from them is nothing short of fantastic. Everyone I deal with is friendly and genuinely interested in my writing and what I have to say. I hear it’s a refreshing change from other traditional publishers. So, my hat is off to the great folks at T&M for including BYL in November’s Kindle First, especially to Emilie (my Editor), to Hattie, Sana and Bekah (author relations and marketing), to Jane (Acquistions Editor), and to the big man at the top, Eoin. Thank you guys for believing! Let’s hope the next instalment is equally exciting. 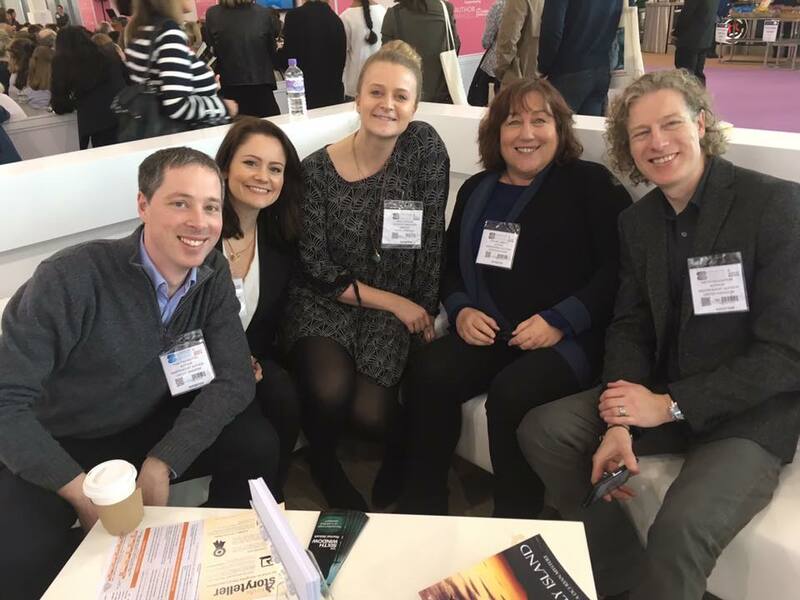 March saw me attend the London Book Fair on behalf of Amazon Kindle Direct Publishing for the third year running, and also the Amazon Academy in Manchester, a brand new event focused on spreading the love of everything KDP. Even though both panels were targetted at indie authors, each setup was very different. 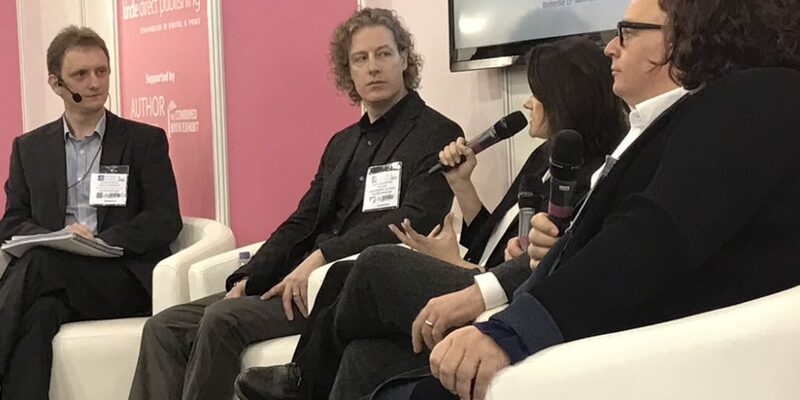 The Book Fair is primarily an industry-led phantasmagoria for publishing, begrudgingly putting up with independent authors, whereas the Academy was a much more personal Q&A directed at writers interested in self-pubbing. You know, it’s always such a huge honour to be invited to talk at these events, and it really is a thrill for me to be able to do it. 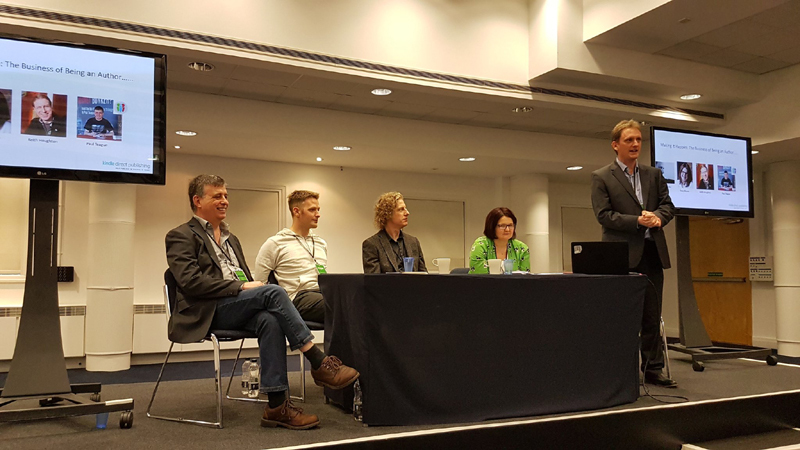 This time around, I sat on an author panel in London with my friends Rachel Abbott, Mark Dawson and LJ Ross, and then in Manchester with Tracy Bloom and Joseph Alexander. As usual, I had a great time, hanging out and speaking with other indie authors, some I’d met previously, and those new to the game. It was lovely to reconnect with my writer pals Paul Pilkington, James Sumner and Mel Sherratt, as well as to spend time with the amazing UK Kindle Team, who are not just nice people, they’re 100% supportive of every single indie author in the country. Big thanks, therefore, go to Darren, the UK Head of Kindle, for trusting me with the mic, as I did get to ramble on a little bit more than usual in Manchester (home crowd, you see), and hopefully only showed myself up a couple of times! I got to talk at length about the realities of indie publishing, and that it’s quite possible to make a decent living without being up at the top of the charts all the time. This is one misconception I come across a lot: indie writers feel they need to be a bestseller to make a living out of their dream. Wrong. Get a couple of good books uploaded to KDP, market them right, and even if they hang around in the top 10,000 books, you can still earn a decent income. Add the audio book versions and you’ll soon be packing in that day job! All said, speaking at these events is my way to pay things forward, and give a little back to those writers just beginning this wonderful journey we call authorpreneurialism! (is that even a word? ), so long may it continue. My latest manuscript (and third stand alone thriller for Thomas & Mercer) had to be with my Editor for November 1st, which happened to coincide with a Florida vacation we’d booked earlier in the year – long before I’d even started writing the book, and way before we’d even thought about moving house. The only problem was, with the house move coming along unexpectedly, it threw back my writing schedule by at least a month, and I found myself with no way to make the deadline. My Editor very kindly gave me a three week extension, which meant that while Lynn was enjoying the Floridian sunshine, I was writing at the poolside. Woe is me, right? Nah, I still managed to have a great time and finish the book. The only problem was, I needed another holiday to get over it! And so, in good faith, I sent the manuscript off to my Editor, knowing I’d get a couple of weeks grace before a heavy editing schedule with my New York Editor, Charlotte, over the Christmas holidays. What I didn’t expect was for my Editor to come back to me with the news that she didn’t like the book. What? . . . No! Of course, I was devastated. I’d spent seven months of my life writing it, only to be faced with the prospect of dumping it all in the trash. My own fault. You see, I thought I was being smart, writing a mystery thriller with a supernatural twist. Sounds good, right? A bit Sixth Sense-ish. A little Jacob’s Ladder-ish. Nope. She hated the supernatural element (and several other ingredients), which was basically the main story thread that wove everything together, culminating in the big ‘oh my’ twist at the end. Maybe devastated is an understatement. Anyway, after I picked myself up off the floor and put away the Kleenex, I assured her that I could rework the entire book, transforming it into a regular murder mystery. I got a new deadline of May 1st, and promptly booked another vacation to coincide with the date. I spent the next four months completely rewriting the manuscript, coming up with a murder angle as the main thread, and devising a brand new ‘oh my’ moment. Then Lynn and I shot off to Corfu for a week to recover! 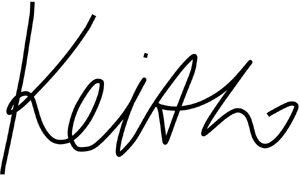 Writing this, my fingers are crossed that the new version meets with approval. I’ll keep you posted. Meanwhile, take care and don’t do anything I wouldn’t do!